In a native industry noted for its character actors, Donald Calthrop stands out as one of the best in the late 20s and 30s. 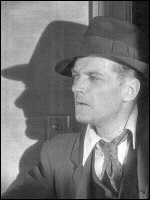 He was a visual performer, who, with his body language, could easily define a role, whether the bullying blackmailer in Blackmail (d. Alfred Hitchcock, 1929), the double-crossing Poole in Rome Express (d. Walter Forde, 1933), Bob Cratchit in Scrooge (d. Henry Edwards, 1935), or the genteel and redundant worker in Major Barbara (d. Gabriel Pascal, 1941), a role completed the day before he died. A grandson of Dion Boucicault , Calthrop made his stage debut in 1906 and his screen debut ten years later; in real life he became a tragic hero, losing his two eldest sons at Dunkirk.